John Kenneth Muir's Reflections on Cult Movies and Classic TV: Ask JKM a Question: Top Ten Science Fiction Films of All Time? Ask JKM a Question: Top Ten Science Fiction Films of All Time? Jason, that’s an excellent -- but also really tough -- question to answer. Honestly, I would have a tough time limiting a list of titles to just ten. The science fiction genre is vast, and it features everything from visions of Dystopia (like ZPG ) to post-apocalyptic worlds (like Planet of the Apes), to adventures set on other worlds, like the Star Trek or Star Wars films. 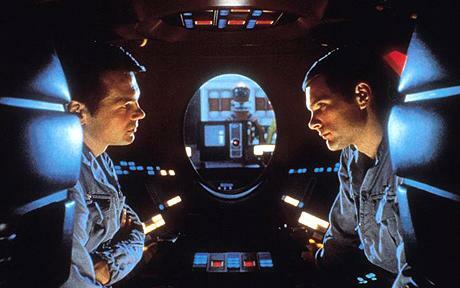 All that expressed, I’d love to read what readers here count as their top ten sci-fi films. If you wish, send me an e-mail of your top ten sci-fi film list -- with or without explanation -- and a name I can attach to it (full name, first name, or just Internet handle…), and I’ll post Reader Top Ten Science Fiction Movies here on the blog in the coming hours and days. Just a note - I'm classing the Alien movies along with The Thing/Invasion of the Bodysnatchers and a few others as horror, so no place for them here. Thank you for putting Blade Runner among the also-rans. I still think it's a great setting for an SF movie, not a great SF movie. The nice thing about it is that Ridley Scott veered so far from the PKD novel that somebody could do a straight version without any loss of impact. I was going to dispute putting Planet of the Apes above 2001, but it would be hard to imagine a mass-market film with a bleaker, more bitter twist. (A shame the ending will never have the same impact it did in 1968.) I'd forgotten that two such conceptually audacious movies came out in the same year. My view of The Matrix is soured by the Wachowskis' extensive, uncredited pillaging of William Gibson's novel Neuromancer. An old story in Hollywood, I know, but still. If the 1982 Thing is horror, why not Alien? Once the xenomorph aerates John Hurt's chest, the story drops all SF trappings and turns into a balls-to-the-wall ooga booga monster story. Glad to see Primer on the list. I have yet to figure the thing out, but that's my problem, not the film's. Love these kinds of questions for the answers they bring. They always stir something in the longtime fans of SF. Well done, John! Proud to have reblogged your post and list this, too ;-).